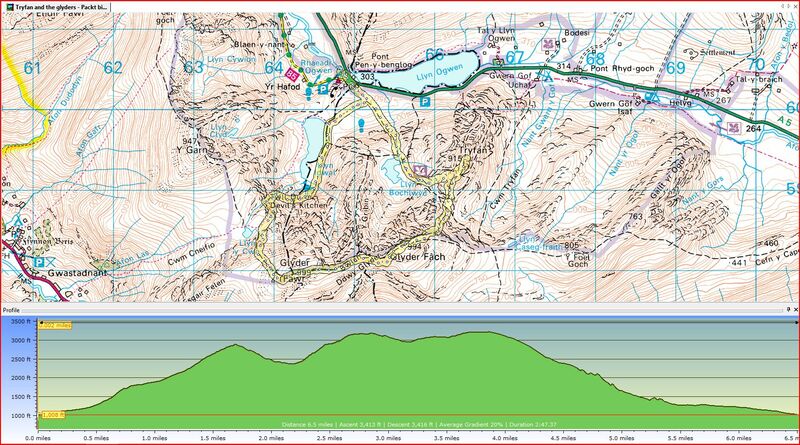 As we followed the track up towards Bwlch Tryfan, the carefully planned route suddenly became the ‘ex-route’. The temptation to add Tryan – which I’d managed to resist when planning the route on paper – became impossible to resist when we could see it so close by. I think my excuse was along the lines that we were about an hour ahead of schedule, or maybe it was the fact it looked like you could pop up and down in 5 minutes, but either way we just had to do it ! 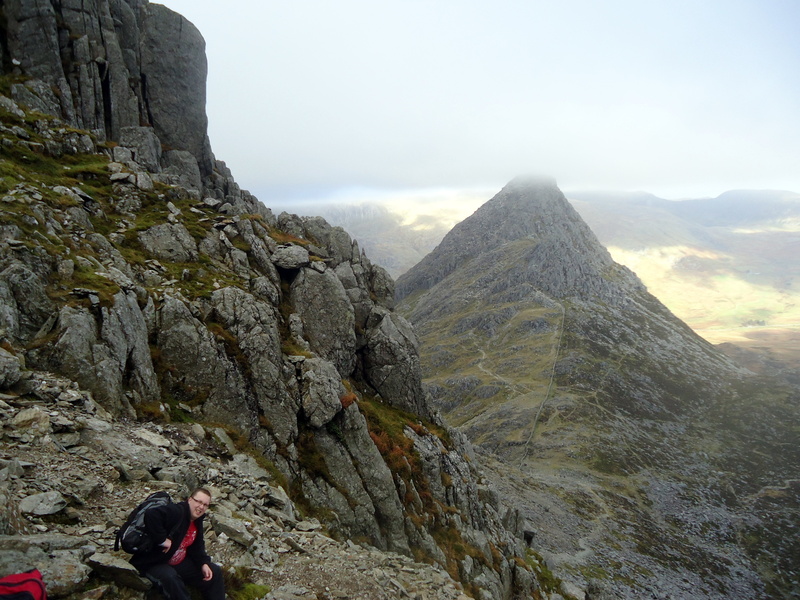 We attacked Tryfan by it’s western flank, giving Julian and Greg their first taste of scrambling. After gaining the South ridge, we followed some of the 100’s of route options until finally arriving at ‘Adam and Eve’. So not quite five minutes then – but well worth the detour. 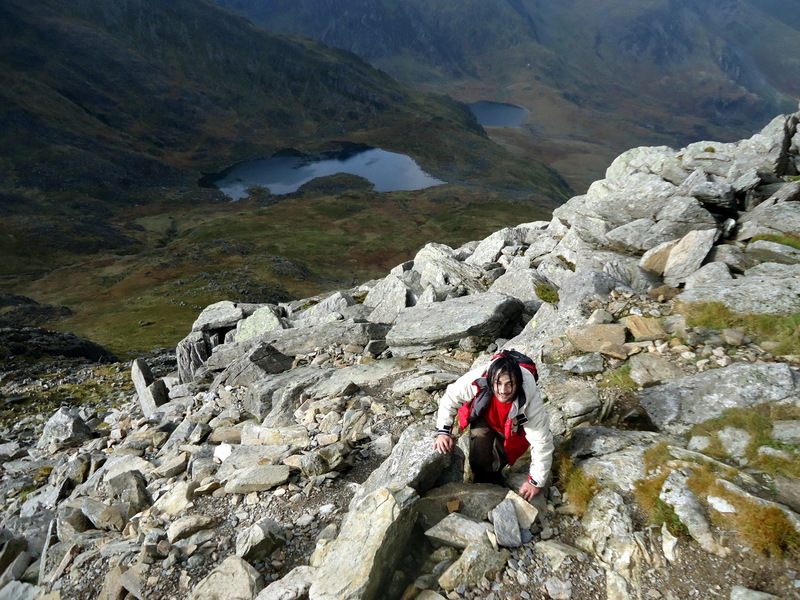 We quickly descended the South ridge, trying as we did so to pick out the best route up Glyder Fach. 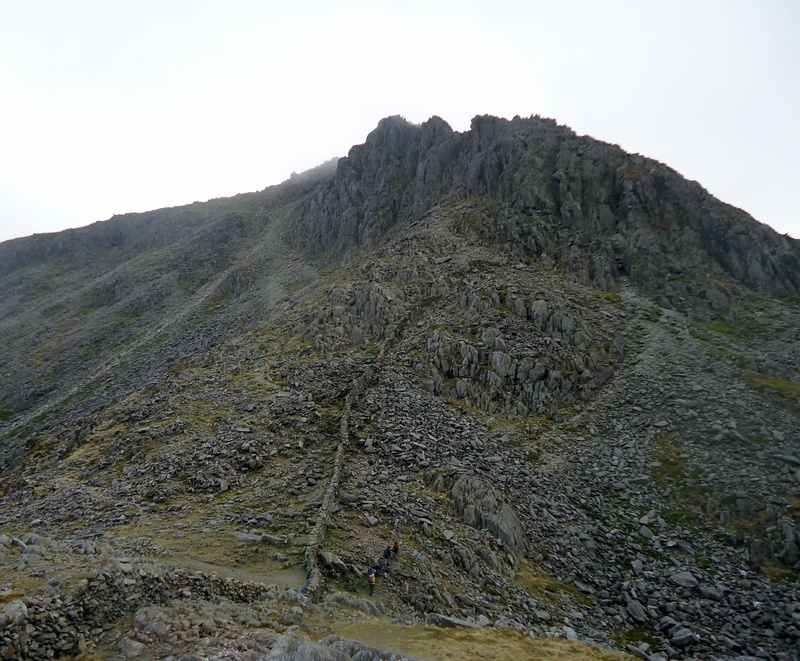 In the end we went for the ‘straight up the scree approach’ – leaving the full Bristly ridge for another day. 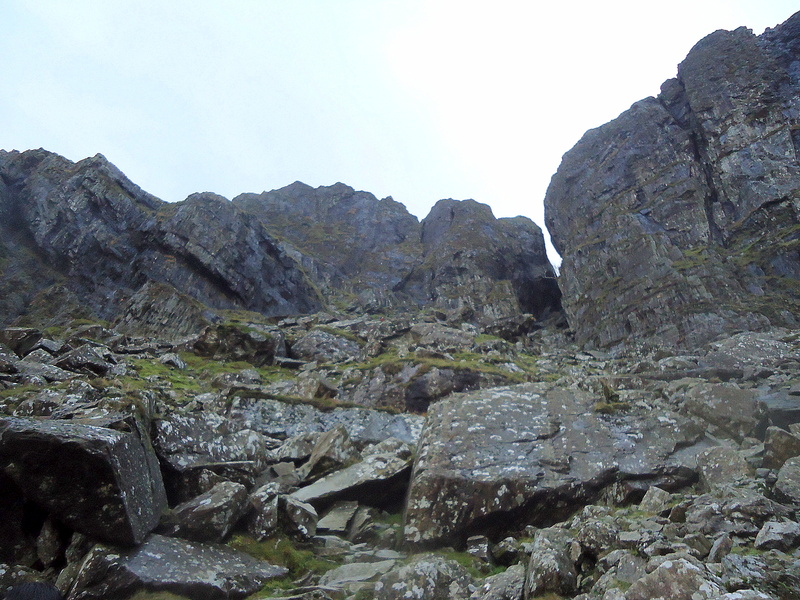 The ever-steepening climb up Glyder’s face offers several great features. Firstly, you can make it as hard or as easy as you like. 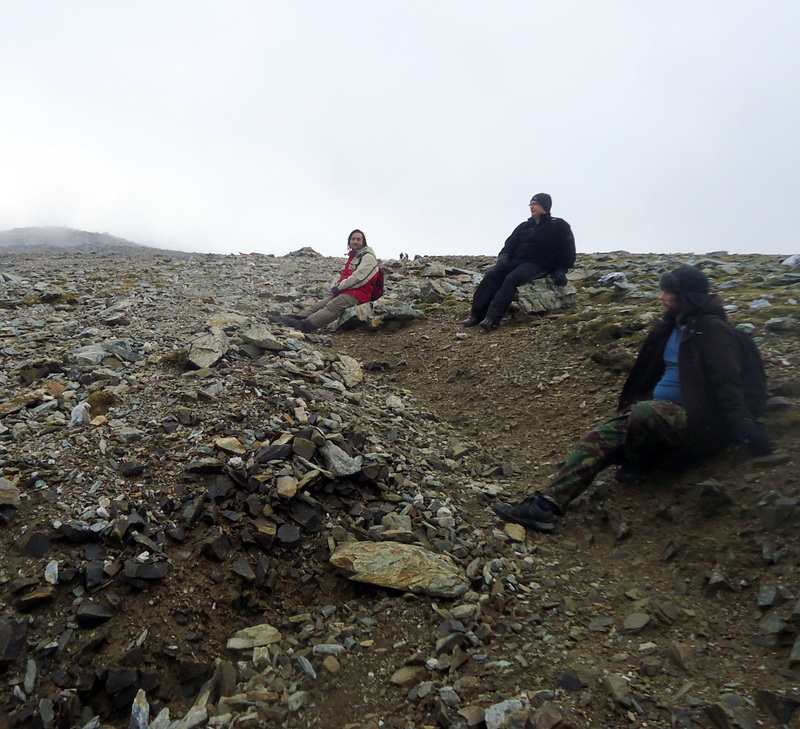 We opted for a mix of scree, then climbing to the right to sample some of the easier sections of the Bristly ridge. 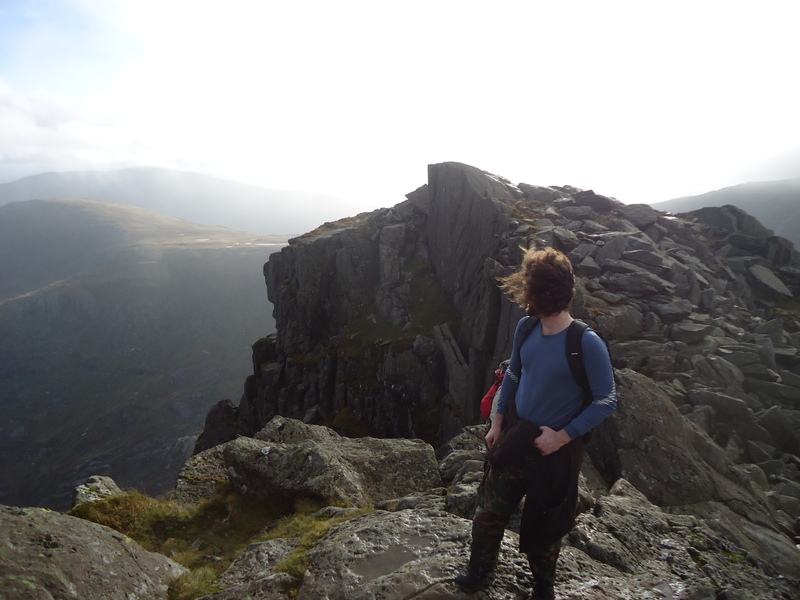 The other great benefit is the fantastic views across to Tryfan. Not sure how I ever thought we could ‘pop up and down in five minutes’! It was at this point that I had to remember my promise to ‘bring every one back home safely’. But … you can’t really do the Glyder’s without a little more excitement – can you ? Every one had coped with some Grade 1 scrambling so well – so you have to push it just a little. The rocky slopes of Glyder Fach offer perfect scrambling practise – a wide variety of routes to choose from, but without too much exposure. 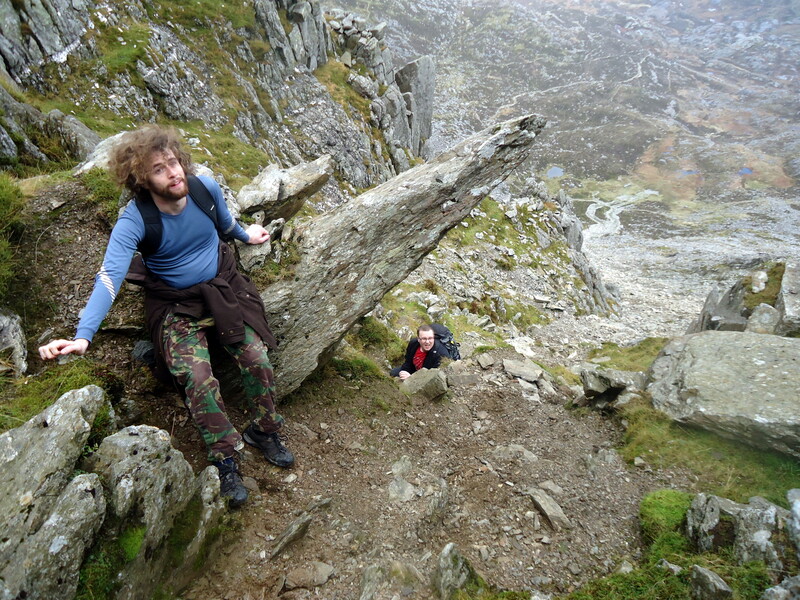 The clamber up Glyder Fach encapsulates everything that makes the Glyder’s such fun. A bit more scrambling and we finally arrived on the lunar-like summit of the Glyder ridge. By then we were well above the cloud base, with huge fragments of splintered rock looming out of the mist around us. After the excitement of the ascent, the summit plateau continues the rock theme, with huge fragments balanced precariously – many pointing skywards like some prehistoric Cape Canaveral graveyard. 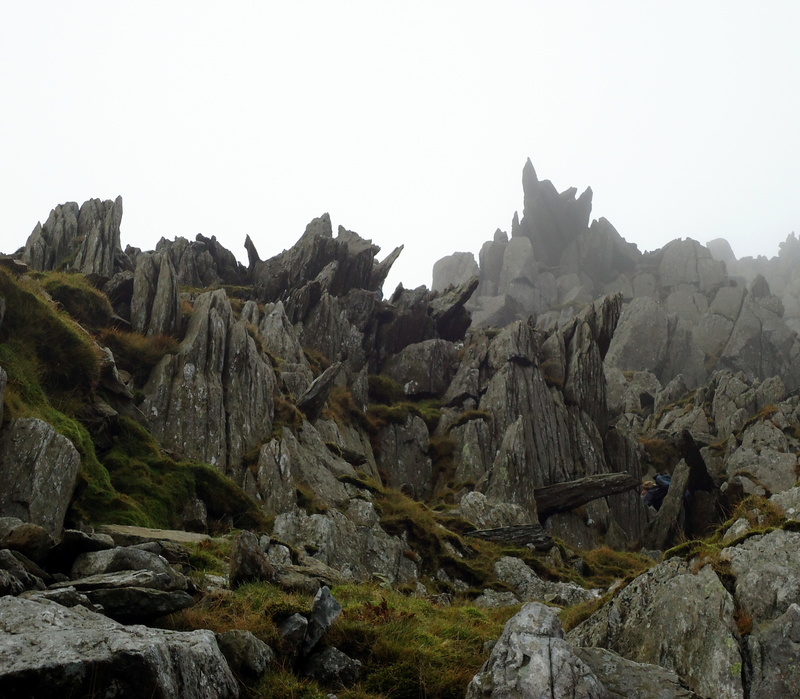 Passing the gothic theatre of Castell y Gwynt, we followed the trail of cairns up and over Glyder Fawr, avoiding the vertical drops down into the Nameless Cwm. From the summit of Glyder Fawr, we searched through the mist for the start of the track, heading down the steep descent into Llyn y Cwm. The last obstacle was to scramble down the track, dropping through a spectacular rock face to finally reach the shores of Llyn Idwal and back to the car park. ‘Man of the Match’ award goes to Martin : who else would spend a day out in mid-November, well above 3,000′ up in the Welsh Mounfains – wearing just a T-shirt ! Respect! 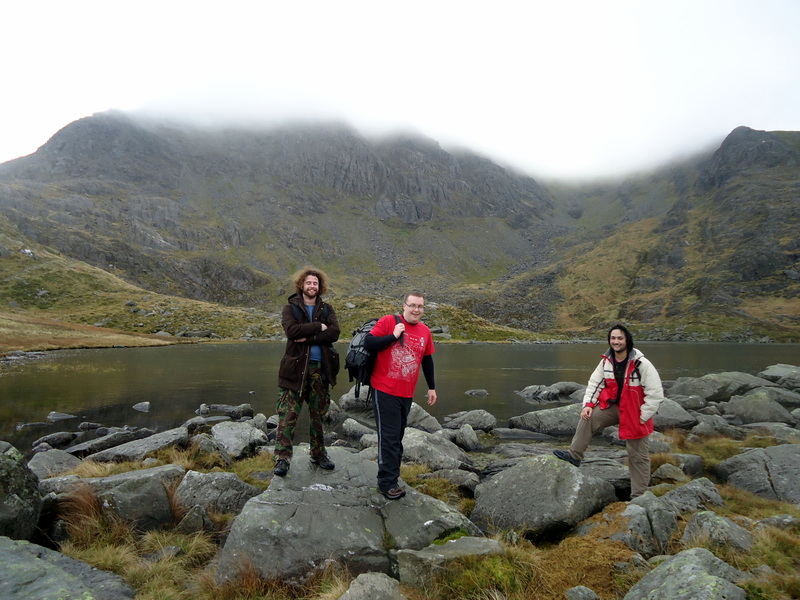 This entry was posted in Snowdonia and tagged Devils Kitchen, Glyder Fach, Glyder Fawr, hiking, Idwal, Tryfan. Bookmark the permalink. 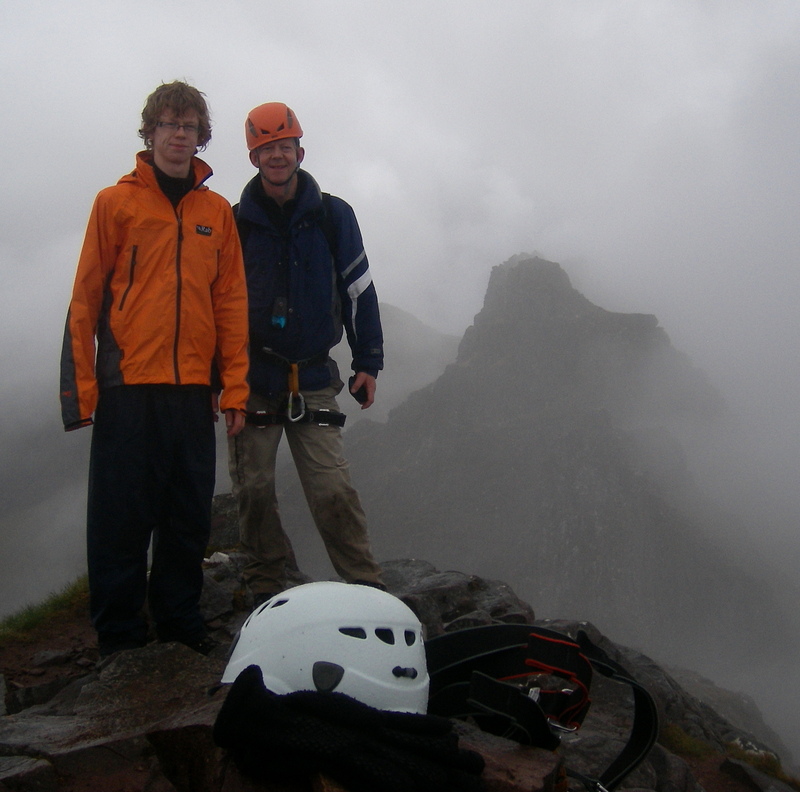 ← Aonach Eagach : Don’t. Look. Down.